This review of Success Circle provides proofs that it is a scam that abuses binary options. It has an anonymous presentation. Success Circle is a binary options program that is fully automated. So it is supposed to trade for you and make you money. And it is free. So you supposedly can get money for free with this system. Really? The truth is that Success Circle is a scam made to make you deposit and lose money. It is not more complicated than that. Here we have the first proof that Success Circle is a scam. 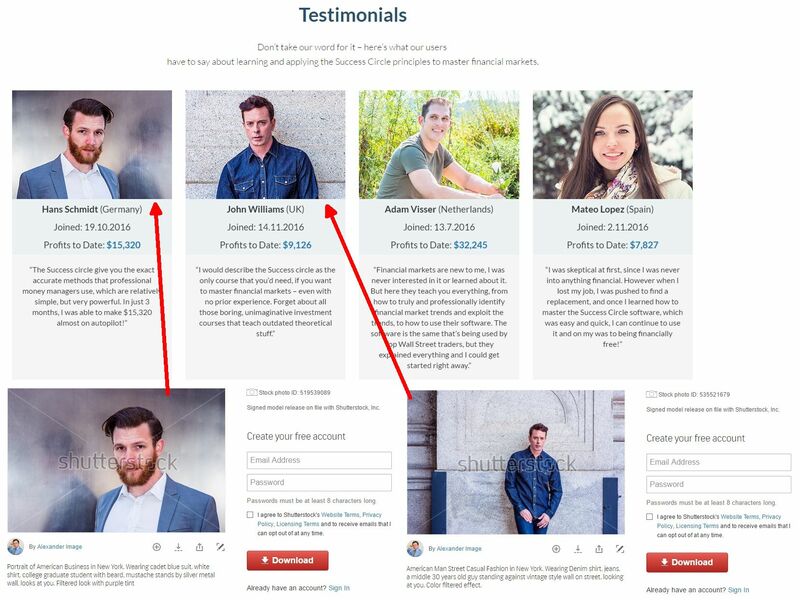 Just look at their testimonials and you will see that they are all fake. Scammers used stock photos with fictitious stories about earnings. These people are not traders and they have never used Success Circle. We tested the Success Circle software that is made to trade binary options for you. It is supposed to make money for you, but in fact the opposite will happen, it will lose your money. How do we know that? Because it is a software used by many scams, just look at the picture to see some examples of other scams that use this same app, like Snapcash Binary of Wiki Trader. We have a lot of feedback from people who have really used this software and they all say that it is losing money! So how does the Success Circle really work? You see, it is not free, because in order to be allowed to use it, you will have to deposit at least $250 with a certain broker, you will have no choice. Why? Because scammers are getting paid by this broker for referring new depositors, this is how they make money. And you can be sure that if you really deposit money and let their software trade for you, you will lose your money. That’s all. Success Circle is an ordinary scam that abuses binary options, it will take your money and lose it. Stay away from it! If you want to try binary options to see how money can really be made in trading, get a free demo account with a regulated broker. Train on the demo until you can trade with profits. Only then you can start trading with real money and real profits.